कब: 19 मार्च शनिवार | शाम 7 बजे. कहाँ: दे अट्टिक, रिगल बिल्डिंग, सी. पि. 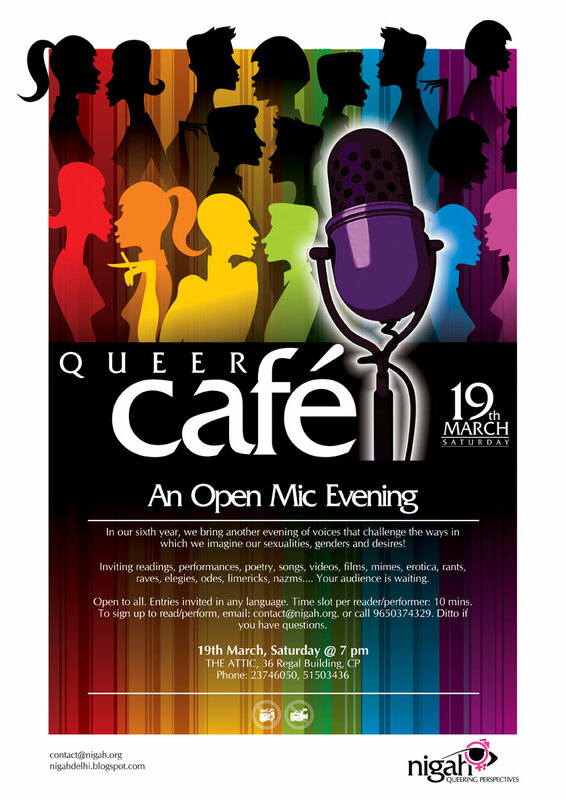 In our sixth year, we bring another evening of voices that challenge the ways in which we imagine our sexualities, genders and desires! Inviting readings, performances, poetry, songs, videos, films, mime, erotica, rants, raves, elegies, odes, limericks, nazms... Your audience is waiting. Open to all. Entries invited in any language. Time slot per reader/performer: 10 mins. To sign up to read/perform, email contact@nigah.org or call 9650374329. Ditto if you have questions. No video or photography will be permitted.